Mount Gay Rum wanted customers to easily find the Caribbean liquor in their locale; thus the company solicited a responsive website redesign to integrate a product locator feature. Mount Gay wanted to direct users immediately from the homepage to separate APIs to find local bars and stores selling Mount Gay Rum products. This meant the homepage and global navigation would need to be redesigned, as well as a landing page and other relevant pages. For this project I worked with a product manager, account manager and visual designer. I was responsible for developing the final wireframes and serving as the UX point person for communication with the client. To create a more efficient experience for users, the navigation was re-designed so users could immediately access pages to search for Mount Gay Rum products in their locale. A simple user flow was created to take users from the homepage to a new landing page. 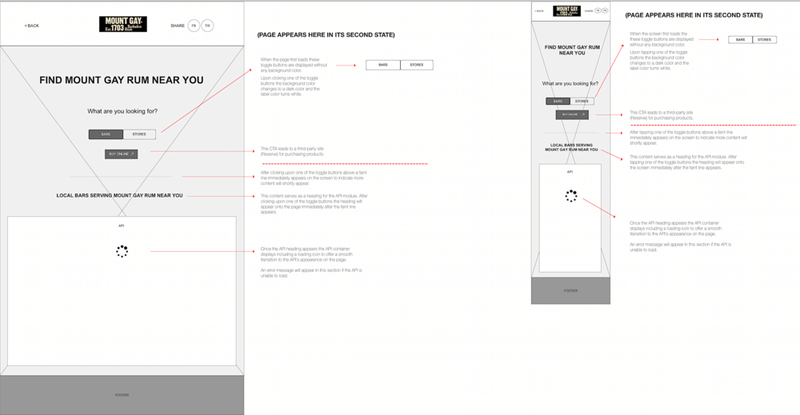 From the landing page two different user flow models were created. In the first model users wanting to buy the liquor online could click on a CTA driving them to a third-party site. Users wanting to find Mount Gay Rum near them could click on the appropriate CTA button, which would display the corresponding API on the page. In the second option users could also choose to go off-site from the landing page to a third-party site to purchase products online. From the landing page users could also choose to go to either 1) a separate page to find local bars serving Mount Gay Rum or 2) to another page to find local stores selling Mount Gay Rum. Using the wireframes, a visual designer produced the visual design assets for the client.